This is a test-paint on one of the 1:285 scale A9 cruisers I bought from GHQ. I've finished it in the Khaki Green No.3 (VMC 887 Brown Violet) and Dark Green No.4 (VMC 888 Olive Grey) disruptive pattern suitable for the Battle of France, 1940. Its been washed with Citadel's Devlan Mud and Badab Black, and dry-brushed in VMC 988 Khaki. First, in this scale the K.G.3 and D.G.4 disruptive pattern is even more pointless than it was full size. It's barely discenable, and at gaming distances it will be completely invisible. Just doing a base Khaki Green No.3, washed and dry-brushed, will be perfectly adequate and will also cut down on painting time. Second, the rusty-metal browns on the tracks and exhaust will need to be exagerrated a bit if I want them to be seen at all. The understated brown I've used just fades into the Khaki Green background.... that's not neccessarily a bad thing of course. These models from GHQ are exquisitely detailed (as they bloody well should be for the price!) and respond really well to the wash-and-drybrush method. Knights of the Air is played with counters, but I thought it would be more visually pleasing with models, and I scratch-built a few from wood and cardboard, but I thought it would be easier to let somebody else do all the hard modelling work so I ordered some 1/300 scale metal aircraft models from Skytrex. When they arrived, I was frankly disappointed in their quality, and two of them (the Albatros D-III and the SE5a) came with the wrong wing pieces — the Albatros was supplied with an upper plane for a Fokker D-VII, and the SE5a was given one for a Sopwith Camel. The wings, fins and tailplanes are all very thick, and the modelling is pretty crude. I thought that I could do a lot better myself, and put them in a drawer where they've stayed for the last twenty years or so. The models do bear some resemblance to the original machines though, and recently I dragged them out and decided to see how they'd paint up. These two — the Fokker Dr1 on the left, and the SPAD VII to the right — are the results. Although they're not masterpieces of miniaturization, they certainly look better with some paint on. I used piano wire for the inter-plane struts; a process that I would describe as fiddly to the point of torture, but once done it does give the models considerably more strength, an important point when dealing with models intended for wargaming. Having finished these two models to what I'd call a reasonable wargaming standard, I'd give Skytrex's micro aircraft a rating of adequate. Barely. I'm not impressed, but they're not so bad as to be unuseable. 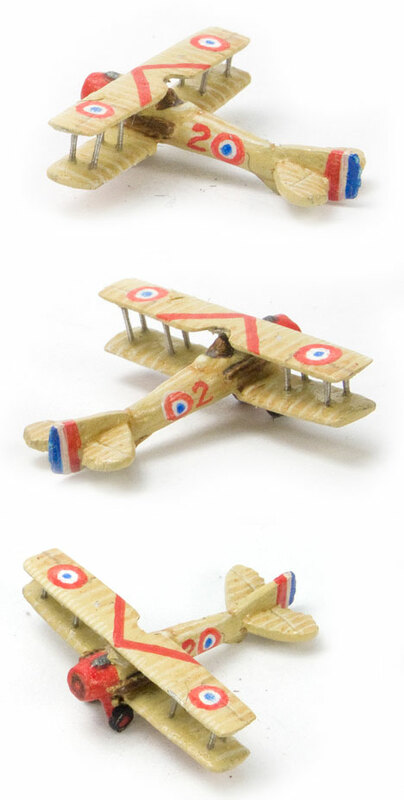 I've since learned that Heroics & Ros also produce 1:300 scale WW1 aircraft, but have yet to see any in the flesh. C-in-C also make some in 1:285 scale, and I do have one of theirs: a Halberstadt CL-IV, which is really stunningly good, and not too much more expensive than Heroics & Ros. Unfortunately C-in-C's range is pretty small, but they do seem to just cover the main bases. By the way, here's a photo of the masters I built after getting the shipment from Skytrex. I never did get around to molding or casting them though. Gaming and modelling has slowed down fairly dramatically around here, partly because quite a lot of my home town, Christchurch, has fallen down recently. Fortunately my own house got off reasonably lightly, just losing its chimney and a bunch of vases, and things are gradually getting more or less back to normal. 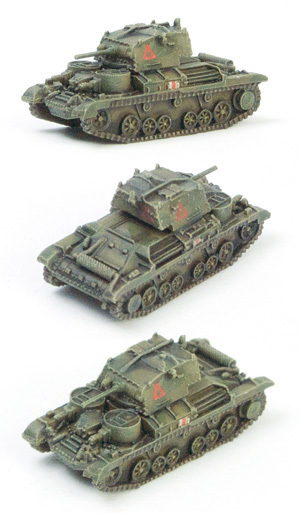 I just received an order from GHQ — some 1:285 scale early WWII British armour (A9, A10, A13 and Vickers light tanks), which I'll be getting on to re-barreling and painting pretty shortly. 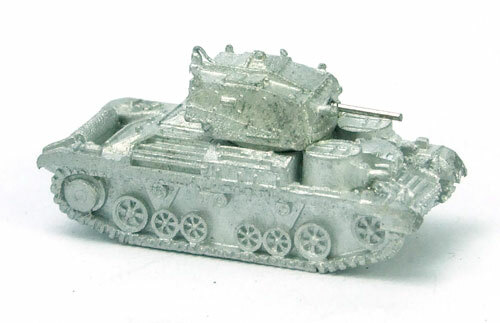 GHQ stuff is bloody expensive, but I have to say they do make a very fine teensy-tiny toy tank. 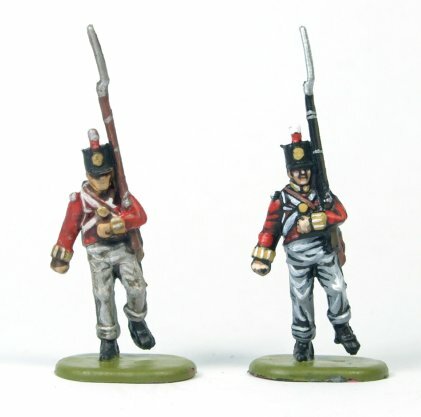 These are 20mm plastic HäT Peninsular War British troops. I've been experimenting with a style of painting for wargames figures I've seen around quite a bit, but which I've never actually tried myself. I don't really know much about Napoleonic uniforms; these guys have just been painted to more or less match the picture on the box they came in. The one on the left (I'll call him Figure A) has been block-painted and then shaded with one of the Citadel washes — Devlan Mud in fact. This is the method I've been using on my WWII figures, and it works well enough for that. The method has the virtue of speed, and it doesn't look absolutely terrible (OK, it does look fairly terrible) but it does look rather flat and the wash has muddied the colours a bit. It's a process that really needs the sharper detail of metal figures to work well. The one on the right (Figure B) is the New Method (that's the Old Method to many, many figure painters). He's has been painted solid black, and then blocks of colour added over the top, leaving black outlines between and to denote creases and the like. The flesh and trousers have also had some highlights painted in. It is slower than the block-and-wash method, but not cripplingly so, and the results are a lot crisper and the figures look better at arm's length (tabletop distance) than the other. Close up it looks pretty messy, but after all wargames figures aren't diorama figures, and the exaggerated shadow and highlight works well for the purpose. I like the results of Figure B a lot, and I think I'll do more of it. I'll have to practice my creases though; I tend to guess a bit about how fabric falls rather than referring to live or photographic references. Note: You can click on the picture to see a larger version of course, but the small thumbnail shown is closer to what the little 20mm figures look like in real life. In many of the modelling articles and discussion groups I've read, Americans have extolled the wonders of Windex Blue as a thinner for acrylic paints. 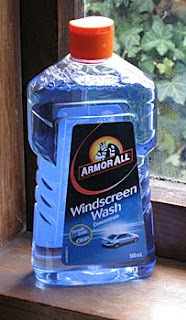 I've never been able to find Windex here in New Zealand, but what I have found is this: ArmorAll Windscreen Wash. I've tried it with Vallejo ModelColor acrylics, and it works a treat. It, like Windex, has ammonia in it, plus (I assume) a bunch of surfactants and detergents and what-have-you. The ammonia helps thin the paint without granulating or blobbing, and the surfactants act to lower the surface tension, working like an acrylic flow-enhancer. You need to use very little to get the paint flowing nicely, much less than you would need plain water, which is advantageous as it means the pigments are less diluted and there is less loss of opacity. I've found it works best as a thinner for airbrushing. It works very well with brushing as well, but it does have a tendency to create lots of tiny bubbles if you get too vigorous with your brush action, especially if you've over-thinned the paint (as I did the first few times I used it). The bubbles do usually dissipate as the paint dries, but it's not guaranteed, so it's best not to take the risk. At my current rate of use, this bottle should last me until about 2050. I myself will think myself lucky if I last until 2030. Note: If you use technical pens or dip pens with indian ink, this stuff should work well as a cleaner for them, though I admit I haven't actually tried it yet. Indian ink cleans up pretty well with ammonia-based cleaners.